Crews received a call from the Hancock facility near Rossview about water leaking in from a nearby window. Bobby and his crew arrived immediately on the scene to assess the situation and seal up the window as much as possible before the problem could be permanently fixed. Luckily, not much water had seeped through and light demo was needed, just a few square feet of drywall. Much to the customers delight the water issue was taken care of quickly, efficiently, and with minimal costs to the customer. So when water seeps through your windows, don't worry! Call us today! Simply overcooking popcorn in the microwave can cause thousands of dollars in damages. Luckily, no one was injured in the fire, yet smoke and soot filled the entire home from garage to master bedroom. The photo shows the cause of loss and the extent of the damage. Crews went to work tearing out all burnt appliances and cabinets before cleaning walls, ceilings, floors, and furniture. To the homeowners surprise only furniture in the kitchen needed to be tossed since we were able to clean other room's furniture to preloss condition. Whether it's burnt popcorn or a grease fire you can trust SERVPRO of Montgomery County for your kitchen fire. Not all water damages are the same, water will move in the direction of least resistance like in this case. Water cascaded down from the sink pipe into the crawlspace. When crews arrived they noticed a large puddle on the vapor barrier and soaked underlayment directly below the sink line. Crews were able to dry the structure from below before mold growth started to show. Our customer was very thrilled that mold has not started to grow! We make disaster "Like it never even happened." 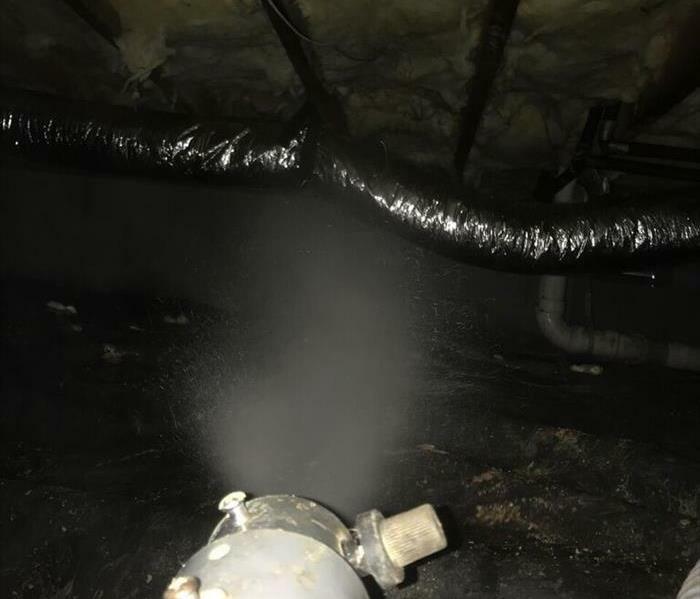 Give us a call today if you noticed excess moisture in your crawlspace or leaky pipes coming from your sink, the issue could be more serious than you think. This was the aftermath of a broken HVAC supply line that leaked into the utility and bathroom. There was significant damage to the bathroom, utility room, and living room. When vanities are affected, they are either removed or modified to allow for drying. SERVPRO crews drilled small holes into the toe kick to allow air circulation thus saving the vanity and sink. This allows more minimal demolition and quicker put back time. All that is needed after mitigation is the put back of the toe kick! For all your water-related cleanup needs give SERVPRO of Montgomery County a call. A twisted or snapped supply line is one of the most common issues in a water damage, especially for a washing machine where large volumes of water flow in a short amount of time. That was the case when this two story apartment flooded from the washer down into the downstairs kitchen. In order to dry the ceiling from above, crews cut out the wet ceiling and duct plastic into the small cutout to circulate airflow. This is a quick and efficient SERVPRO process to dry out tough to reach materials. Our customer couldn't believe how quickly we were able to dry out their home. We make disaster "Like it never even happened." 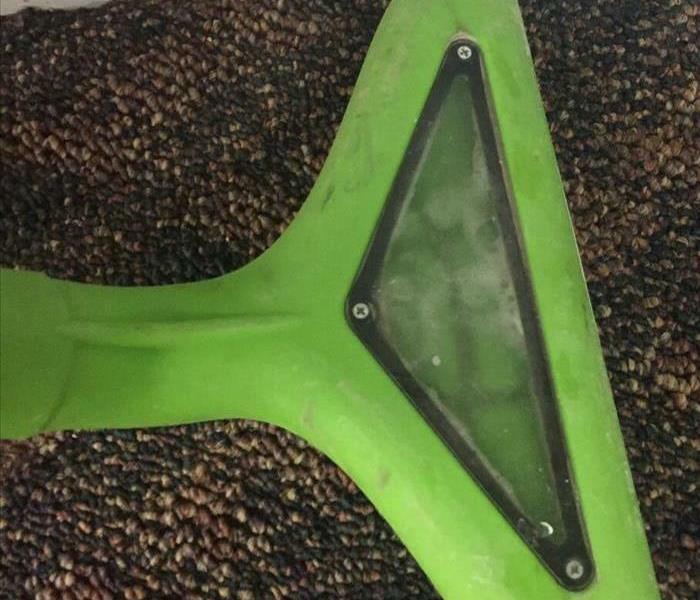 SERVPRO's next specialized equipment is the Thermal Fogger. If you have ever had a mold outbreak in your house then you probably know that the mold you can see is only the beginning of the problem. Believe it or not, only 10% of mold is visible – the other 90% is microscopic. Foggers are used mostly in crawlspaces where some spots may be difficult to assess. Once joists are wiped and vacuumed, crews fog the entire areas with specialized product. Want to learn more about SERVPRO's specialized equipment? Check out http://www.SERVPROmontgomerycounty.com/mold-removal-process. Our next equipment spotlight is the SERVPRO dehumidifier. A dehu is essential to reducing humidity in your home or business after a water damage. Dehumidifiers reduce humidity levels, making your home less hospitable to allergens such as dust mites, mold, and mildew. 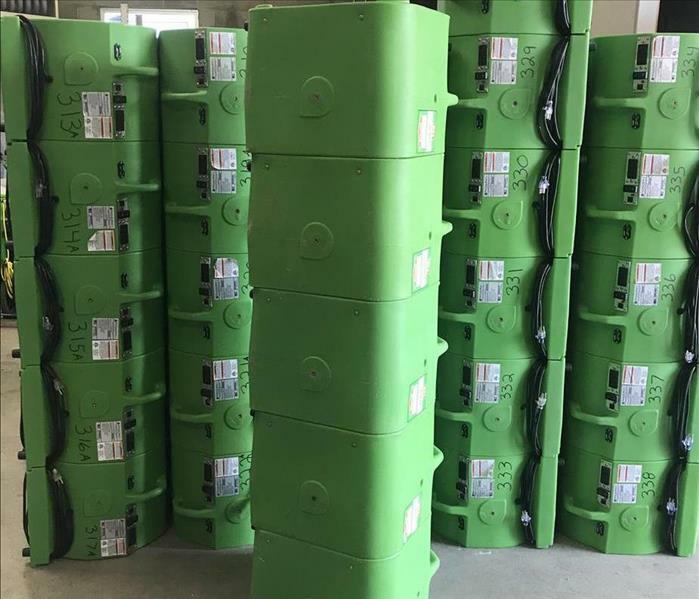 While working along side air movers, many of SERVPRO's dehu's can pump up to 160 pints of water per day greatly reducing your moisture readings. 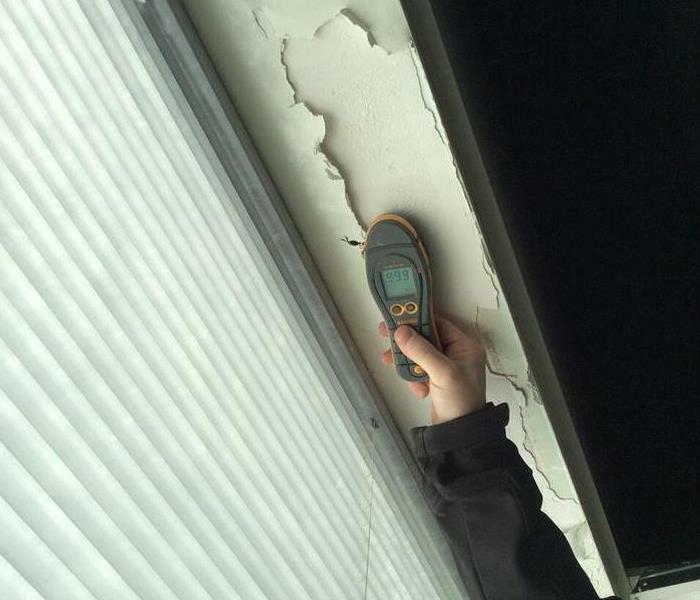 Like we discussed in previous spotlights, SERVPRO's goal is to have a moisture reading below 17%. 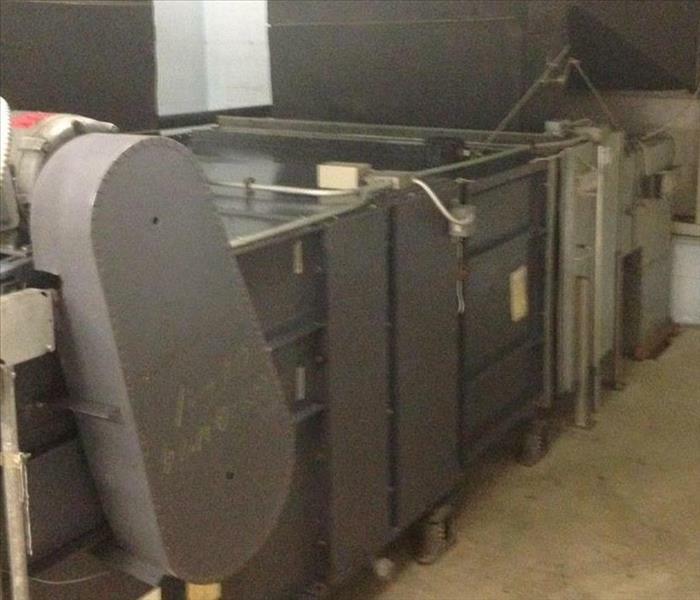 This ensures that all affected materials are dried and reduces your chances of mold damage down the line. 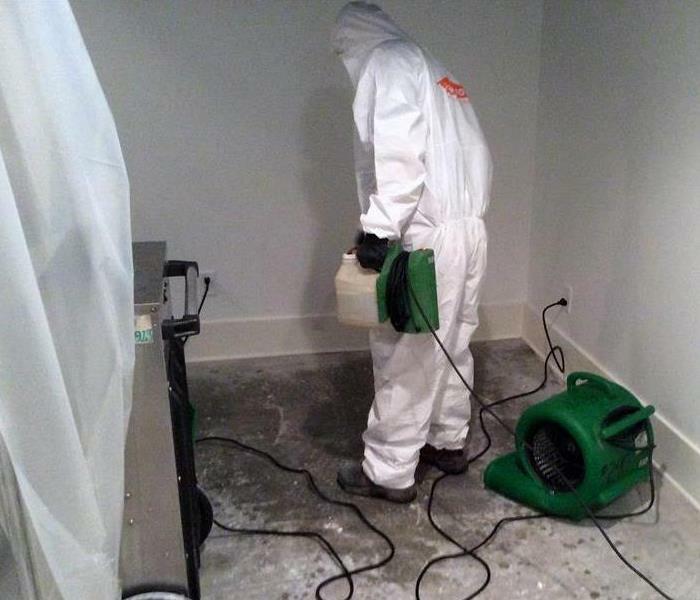 For more information on SERVPRO's specialized equipment, check out http://www.SERVPROmontgomerycounty.com/water-repair-process. Our next equipment spotlight is the SERVPRO Air Mover. Air movers are an essential tool for water restoration jobs. They offer high-velocity airflow, which leads to faster drying times to help get the job done quicker and more efficiently. Professional grade air movers are used to improve air circulation to speed up evaporation and reduce drying times. This helps get your home or business back together and running smoothly. Simply put, air movers are heavy duty industrial fans used to speed up the drying process due to water damage, whether caused by heavy storms, flash floods, hurricanes, leaky pipes, etc. Have more questions about SERVPRO's specialized equipment? Learn more at http://www.SERVPROmontgomerycounty.com/water-repair-process. 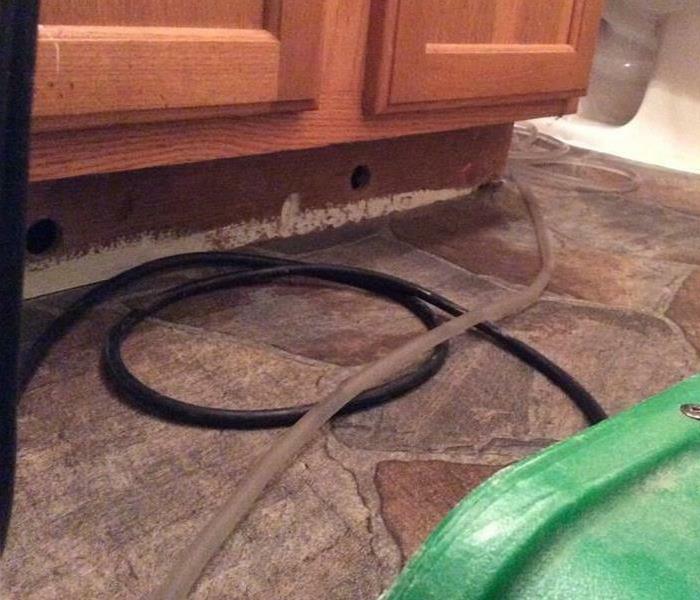 SERVPRO of Montgomery County uses specialized equipment to determine the scope of your water damage at this stage. We inspect and test to determine the extent of damage and how far the moisture has traveled to ensure proper and complete restoration. Today's spotlight is on the protimeter or moisture meter. The moisture meter is simplified into three distinct stages. Moisture below 17% is considered dry and is color-coded green. Next is "At Risk" which is given the color yellow. Finally a "Wet" reading is anything over 21%, since this is the industry standard. This allows us to thoroughly and quickly restore your home back to preloss condition. When this homeowner's tree fell on her house after a bad storm, the first person they called was SERVPRO of Montgomery County. After the tree was removed from the roof crews got to work tarping the entire roof to prevent flooding before roofers arrived. As shown in the photo, the tree caved in the right side of the home affecting ceilings and drywall in the bedroom and bathroom. Didn't know SERVPRO tarps roofs? Absolutely! SERVPRO of Montgomery County offers an abundance of building services. Check out more of our services by visiting http://www.SERVPROmontgomerycounty.com/building-services or give us a call today. 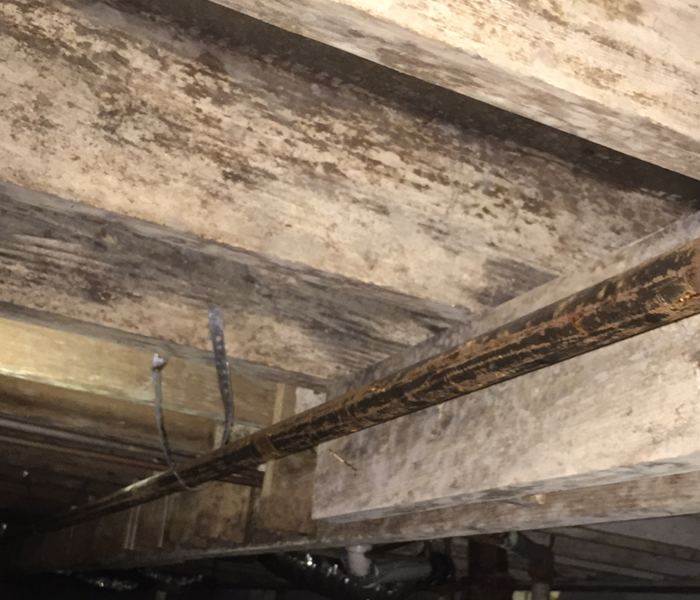 Sometimes, crawlspaces are not infested with heavy mold spores. They are just covered in dirt, grime, and cobwebs. 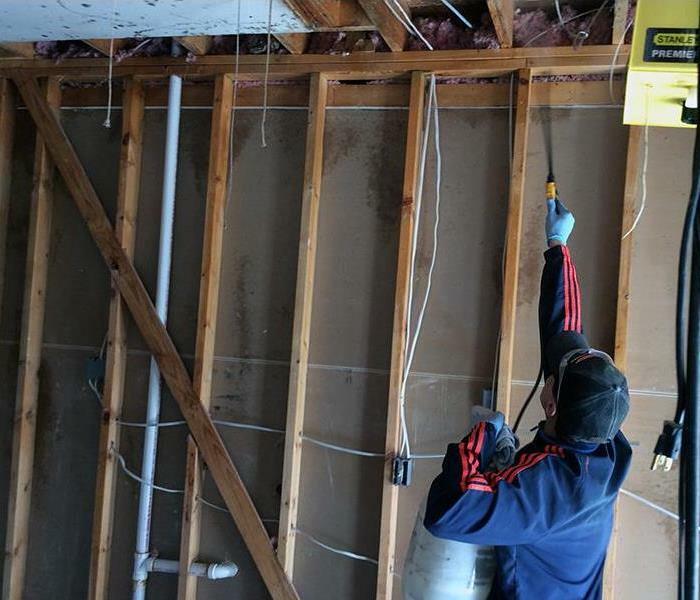 Crews will go in and replace any torn or damaged vapor barrier and insulation while cleaning each joist, stud, and pipe before flogging every square inch with SERVPRO product. More importantly, cleaning out your crawlspace can impose great benefits like improving air quality and temperature, reducing energy costs, and preventing future damage. Trust the experts at SERVPRO of Montgomery County to clean-out your crawlspace and make it "Like it never even happened." Give us a call today for a FREE crawlspace estimate at 931-645-1285. 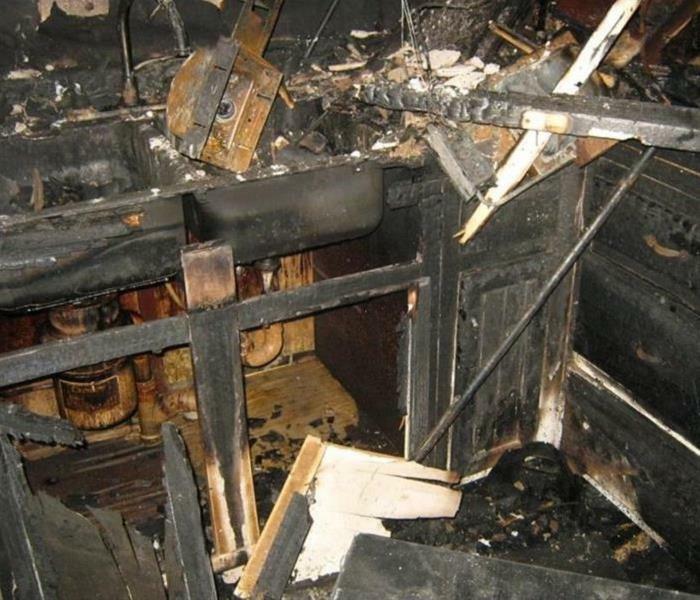 Kitchen fires are one of the most common sources of house fires. This fire in the Fort Campbell area was started on the stove in the kitchen and move throughout the rest of the house. This photo shows the extent of the damage to the microwave. Crews were able to go in and remove and discard any destroyed utilities while removing any smoke and soot from the house. Appliances were quickly replaced to the satisfaction of the customer! If you experience a kitchen fire in your home, don't worry! We make disasters "Like it never even happened." Give us a call at 931-645-1285. It only takes a small water leak, or even excess humidity for mold to form in your Clarksville crawlspace. Then, mold can spread quickly through the property in as little as 48 hours. Mold can produce allergens and irritants, and it has the potential to cause other health effects. 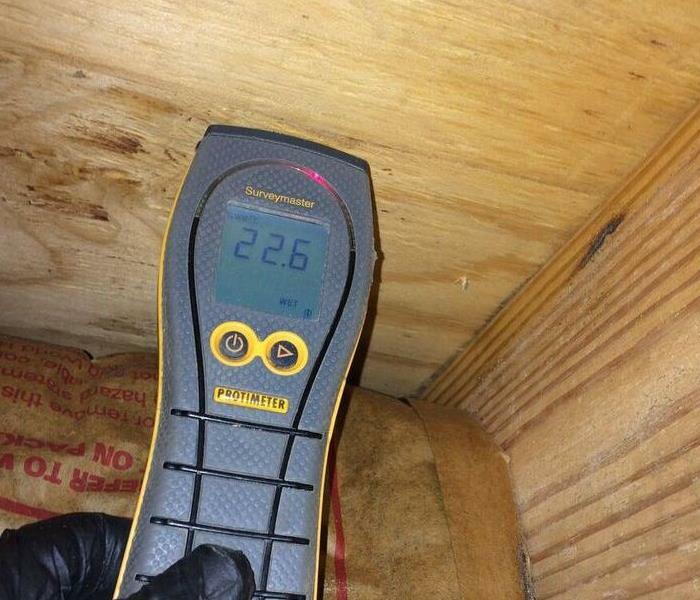 If your crawlspace has a mold problem, we can inspect and assess your property and use our specialized training, equipment, and expertise to remediate your mold infestation. Fire damage, including smoke and soot, affects not only the structure of your house but also your belongings. SERVPRO of Montgomery County understands your family’s furniture, clothing, keepsakes, and other belongings make your house more than a structure; they make it home. 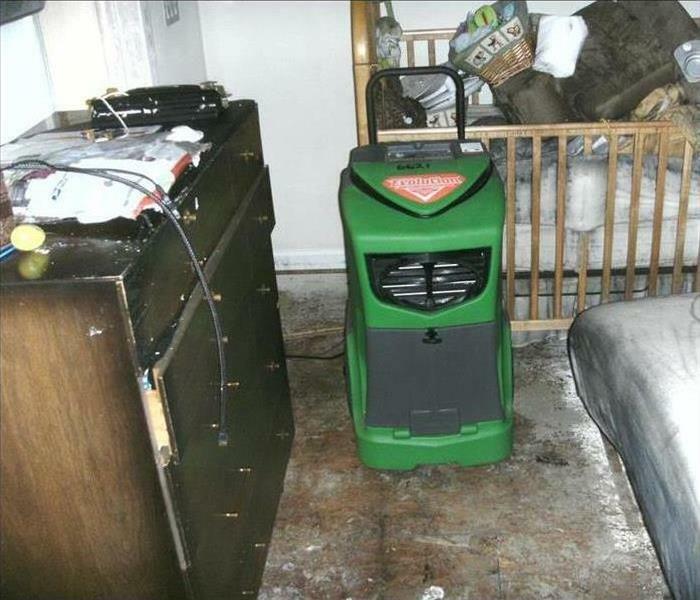 SERVPRO of Montgomery County specializes in restoring contents damaged by water, fire, or mold. Our expertise and “restore” versus “replace” mentality can help you save money while preserving precious keepsakes that can’t be replaced. We pretest your belongings to determine what items we can restore to pre-fire condition by using several methods of cleaning your contents. SERVPRO of Montgomery County uses specialized drying equipment to get the job done quickly and efficiently. One of those tools in an extraction wand. The wand is like a really powerful vacuum sucking water out of almost any material like concrete, hardwood, vinyl, and carpet like in the photo above. The clear opening on the top allows the technicians to see the water flowing from the carpet into the extractor. The wand allows our crews to save time to get your home or business back up and running. To learn about more of our specialized equipment give us a call at 931-645-1285. While tropical storms and hurricanes may seem far from Clarksville, their impact isn't. Heavy rain and winds can be felt hundreds of miles away and their destruction can be inevitable. This was the case in this residential home in Woodlawn. After a night of heavy rain, water made its way into a bedroom through a small crack in the roof. Notice all the water marks surrounding the ceiling. 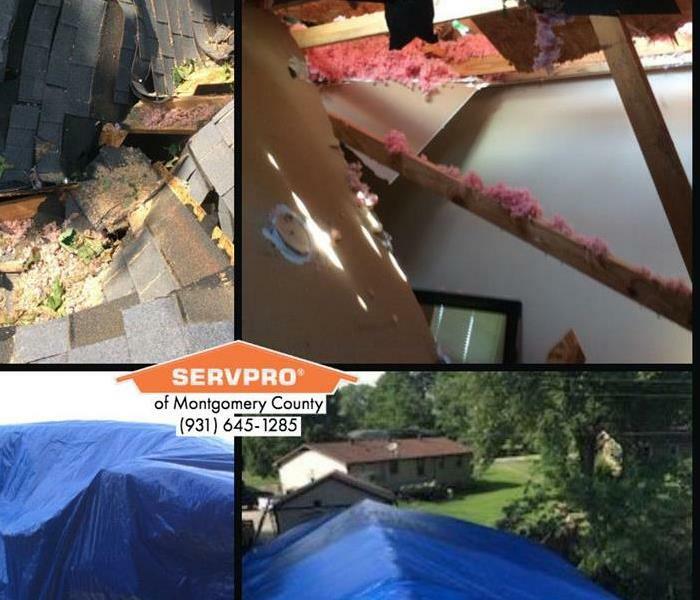 SERVPRO of Montgomery County tarped the small section of the roof before removing the wet ceiling, insulation, and laying down drying equipment. Our customer was thrilled with the quick response time and tarping before a roofer could arrive. To learn more about our residential services give us a call at (931) 645-1285. Roofs can take a beaten no matter the season. That's why having your roof inspected or replaced every 5-10 years is needed. Many of SERVPRO of Montgomery County's storm calls are due in part to leaky roofs or cracked windows. This is one of those cases where a leak in the roof allowed water to enter through the attic into a bedroom. When the homeowners woke up they noticed their ceiling falling down because of the weight of the water. If you have a crack in your roof call SERVPRO of Montgomery County at (931) 645-1285. We are "Ready for whatever happens" 24 hours a day, 7 days a week. This is a photo of when crews arrived to an emergency call about a leaking ceiling. The homeowner noticed water leaking from their HVAC in the attic down to their kitchen. SERVPRO of Montgomery County got to work laying down plastic to protect the homeowner's new cabinets before cutting down the wet ceiling, removing wet insulation, and setting up containment. The homeowner and the insurance company was very pleased with the quick and professional job SERVPRO of Montgomery County provided. 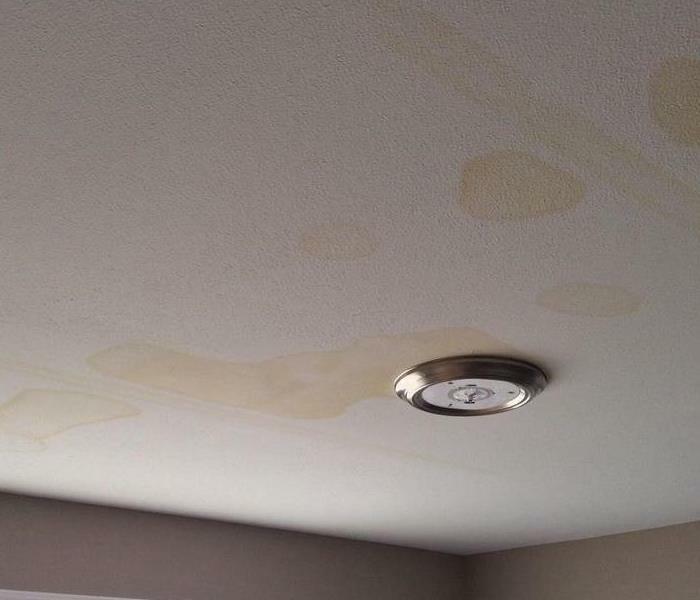 If you experience a leaky ceiling, don't stress! Give us a call at (931) 645-1285. We make disasters "Like it never even happened." This fire was considered a total loss by the homeowners and emergency personnels because of the significant smoke and soot damage. Crews were instructed to completely gut the home all the way to the studs. Crews then wiped down every inch of the structure with SERVPRO approved products to eliminate the smoke smell and feel. The owner couldn't believe how quickly and completely we were able to clean the soot from the structure. At SERVPRO of Montgomery County, we make disasters "Like it never even happened." We're here to serve you 24/7. Give us a call today at 931-645-1285. Mold thrives in areas with lots of moisture, such as around leaks in roofs, windows, pipes, or where there has been flooding. In this example, the HVAC was leaking causing mold growth surrounding it. Most homeowners only notice their attic is leaking from above and don't realize the mold that is growing. 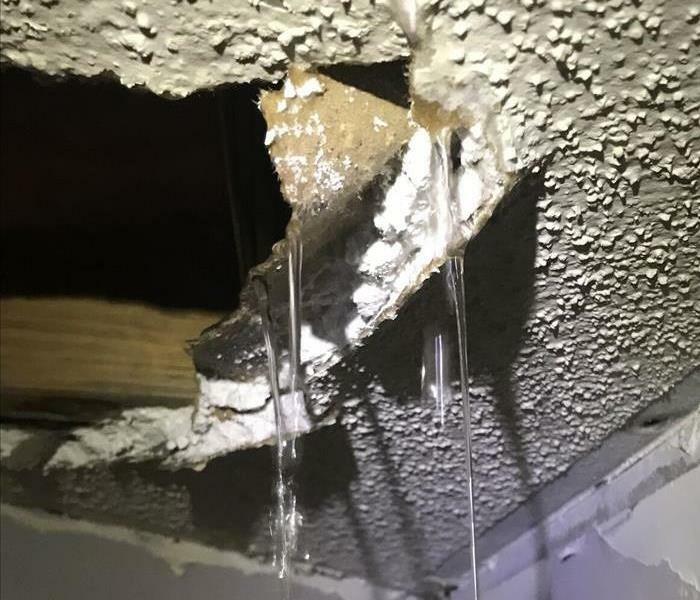 Once the HVAC company fixes the leak, our crews went to work to dry out the attic while at the same time cleaning all visible mold from the affected area. We make disasters "Like it never even happened." Give us a call today at 931-645-1285. Water works in mysterious ways and no two water damages are the same. Here is one of those cases where water flowed in from the roof, affecting one of the cabinets. Notice how the water was pulling the cabinets apart from the staples. 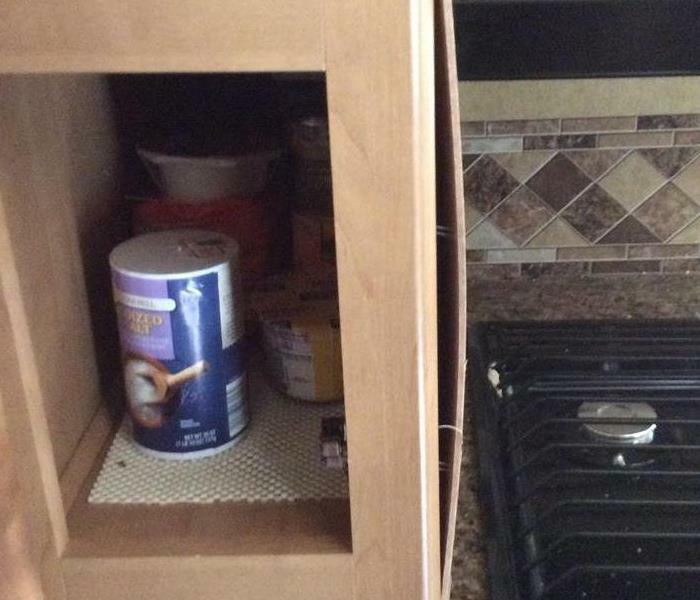 In some cases like this one, insurance will cover to replace all of the cabinets whether affected or not. 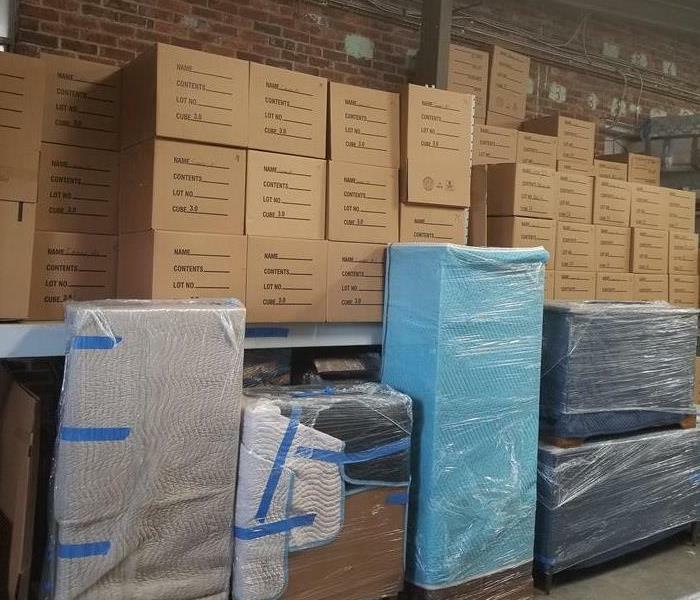 SERVPRO of Montgomery County got to work packing out all the items from the cabinets, drawers, etc. before disassembling the cabinets. Our customer was very pleased with the quick mitigation process and the wife loved her brand new kitchen! 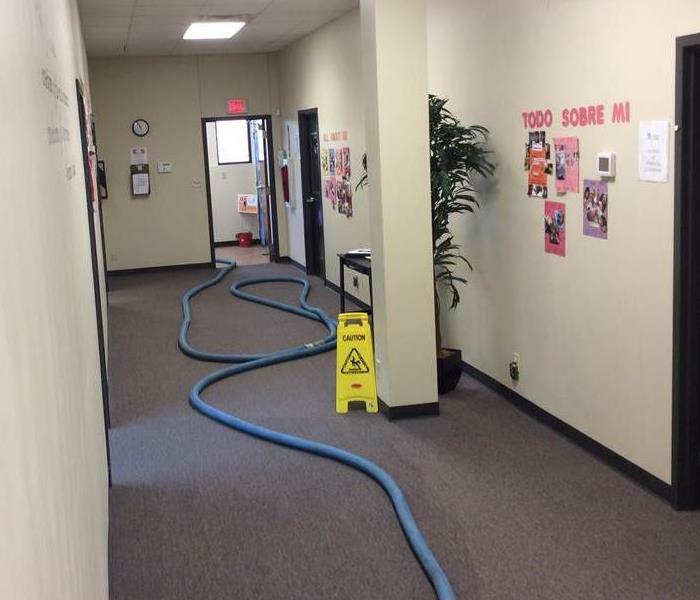 This was the result of a busted pipe in one of the classroom's sinks that flowed from the bathroom, into the classroom, then eventually into the main hallway. SERVPRO of Montgomery County was on the scene moving wet materials out of the way and extracting the standing water from the carpet. Crews also removed any sinks, toilets, or tubs in order to dry out the bathroom. The customer couldn't believe how quickly and completely we were able to extract the water and locate the cause of loss. SERVPRO of Montgomery County made it seem, "Like it never even happened". Heavy rain mixed with a leaky roof or cracked windows can lead to a messy situation. 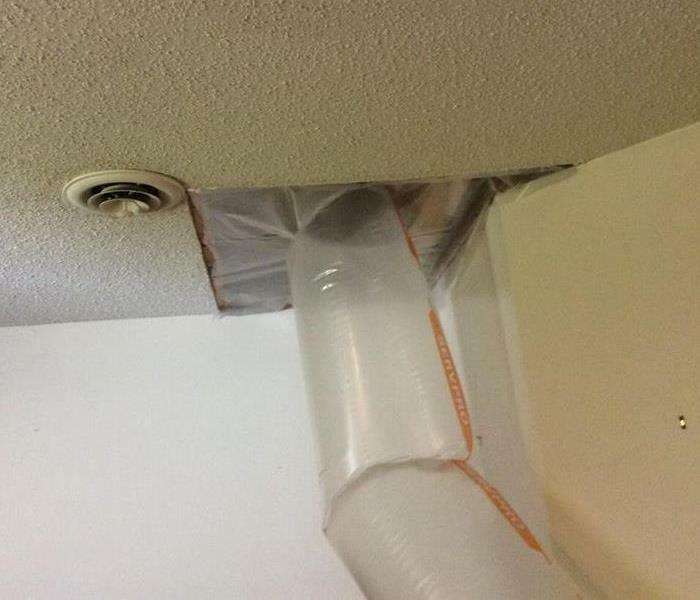 Luckily SERVPRO of Montgomery County is "Ready for whatever happens". 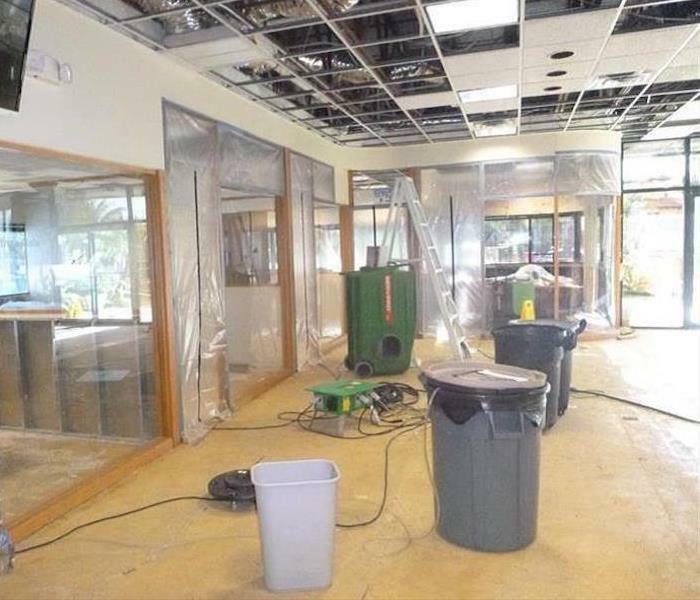 When storm damage caused this office suite to flood, our crews were there immediately to extract all the standing water from the carpet and lay equipment down to dry out the affected areas. Within 4 days all of the carpet and walls were dried. Our customer was very satisfied with the quick process and relieved that her business could remain open during the mitigation. 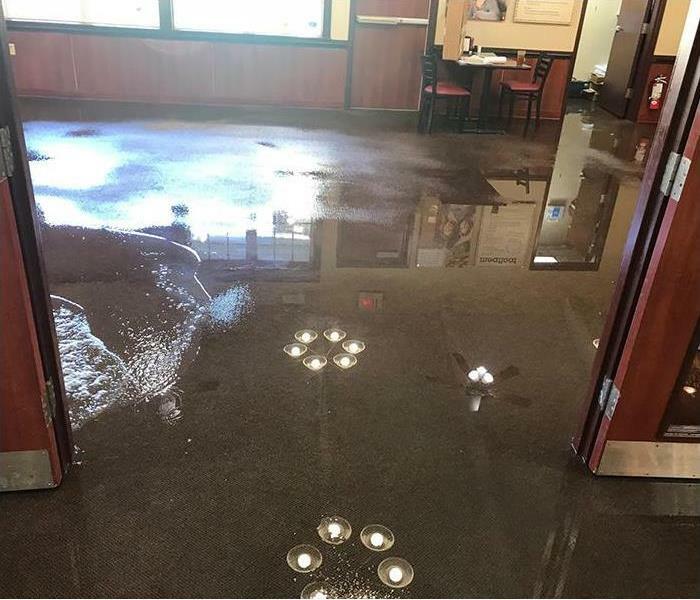 So if you walk into your business at 8 a.m. and notice standing water, don't worry! Call SERVPRO of Montgomery County at 931-645-1285. General guidelines suggest having your roof professionally checked every 3-5 years depending on the material. This is to ensure there are no major cracks or leaks where water could go in. This is a photo of one of the many areas in the Hearthstone retirement home where water was flooding in due to rain. Do you have a leaky roof that needs to be tarped? Give SERVPRO of Montgomery County a call at 931-645-1285. This is one of the HVAC units cleaned at the private school. It goes to show our NADCA trained technicians can handle any size unit, from commercial to residential. Ventilation systems are often the biggest culprit in poor indoor air quality. Make it a priority to inspect the ductwork of your home or business. SERVPRO of Montgomery County Professionals routinely inspect the heating, ventilation and air conditioning unit (HVAC). Keeping them clean can extend the life of the equipment. This can in turn save you money and give you cleaner air to breathe. SERVPRO of Montgomery County can remove soot from your home from top to bottom. 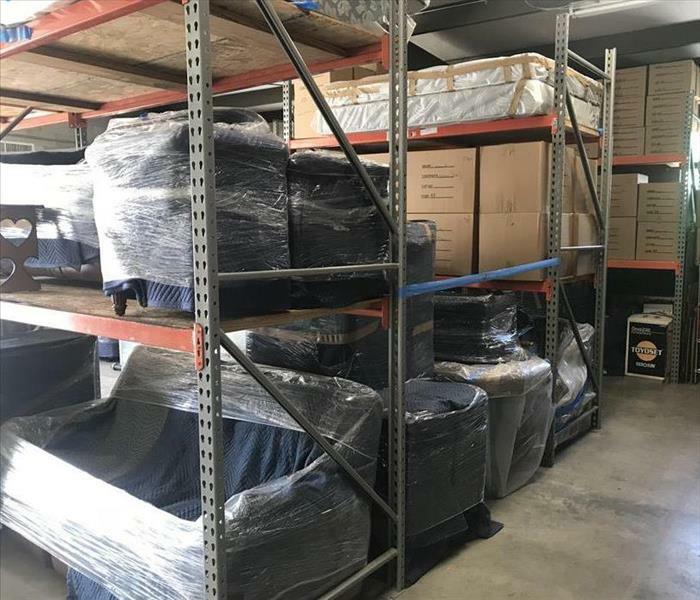 We can also pack out your contents back to our facility, clean and store them until your house is ready to be moved back in. 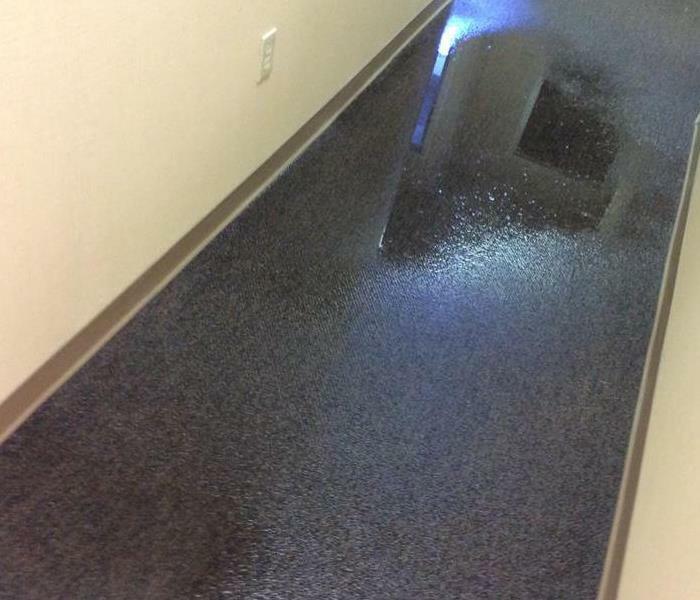 Has Your Business Had A Water Damage? The First Few Hours Our Very Important. No matter what we are "Ready For Whatever Happens" This trailer is locked and loaded with supplies and equipment. 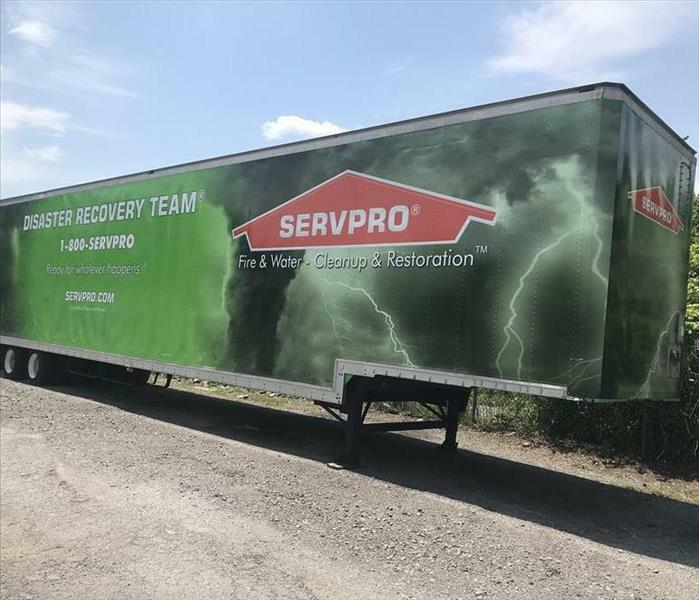 When a disaster strikes pick up the phone and call SERVPRO of Montgomery County. A tornado touched down in Clarksville and SERVPRO of Montgomery County was called in for emergency services. 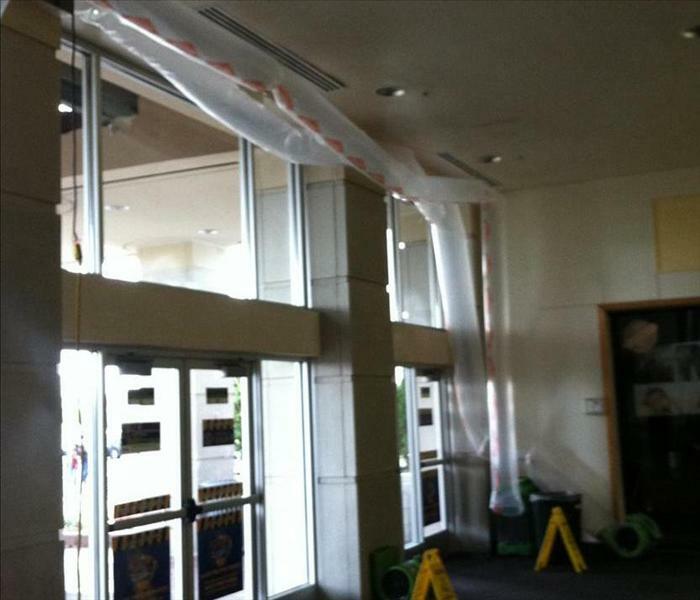 We responded quickly and put up several tarps to stop further damages from happening. A faulty electric outlet caused a fire at this home. SERVPRO of Montgomery County was dispatched for emergency services. Our technicians were able to board up the home and then clean it once it was released by the Fire Department. Once the cleaning was done our construction crew rebuilt what was affected by the fire and made it "Like it never even happened." 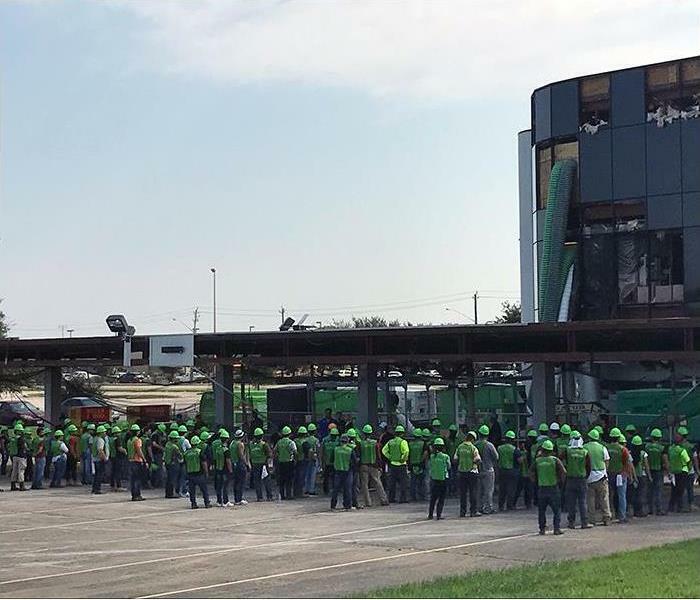 Our SERVPRO Extreme Team tacked a difficult commercial fire damage and came away with positive results. 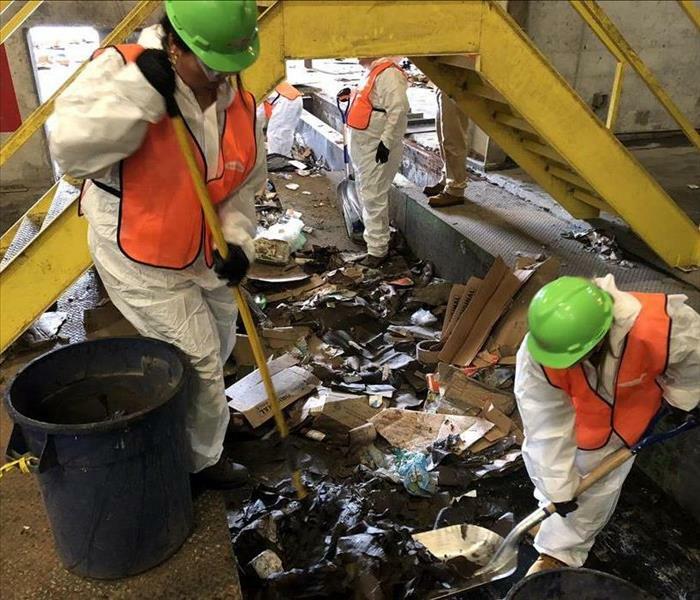 After all the debris was cleared from the conveyer belts the team pressured washed the belts to get them ready to be inspected by the company. SERVPRO of Montgomery Country has the skills to take care of any Clarksville fire damage. We responded to many calls after the storm that raged through Clarksville. The tornadoes caused many disasters through town for residential homes. We put several tarps on roofs and boarded up windows. We see a lot of mold issues in both residential and commercial buildings, but once we arrive on the scene to remediate the issue, you can be sure there wont be any regrowth since we use antimicrobial spray. When we remediate mold situations, we often apply antimicrobial in order to prevent further growth. But don't worry, our antimicrobial products are safe for both small children and pets! Our team responded to a large scale commercial call in this photo. We are "Ready for Whatever Happens" at SERVPRO of Montgomery County, working around the clock to get companies like this back in business. 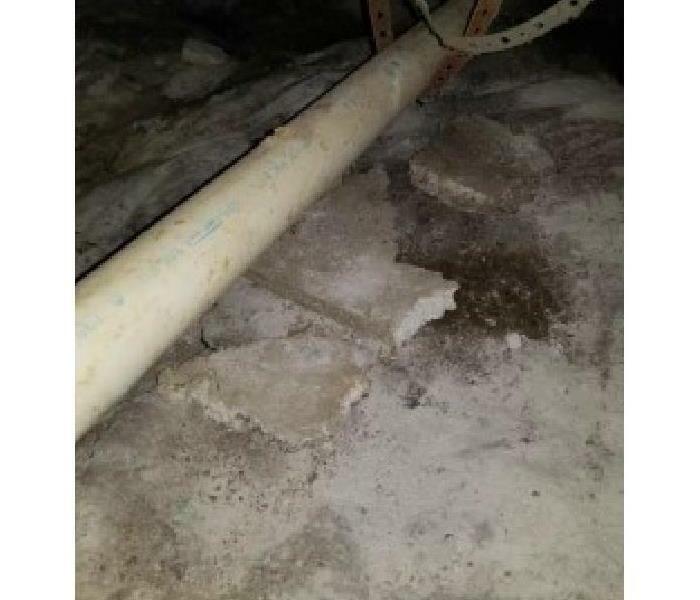 SERVPRO of Montgomery County responded to a local restaurant's call regarding their burst sprinkler heads, which occurred due to freezing pipes. Call us today to here about our Emergency Ready Program. The fire that started in the kitchen of this Clarksville home charred the interior of that room. The firefighters knocked out the window so we boarded it up to keep out any bad weather, vermin, or vandals. Commercial water damage occurred at this Clarksville retail store when the sprinkler system activated accidentally. The sprinklers left standing water on the floors and lots of moisture on the ceiling tiles. We were called to clean up the water and remediate the secondary damages. If water damage affects your home or business, call SERVPRO of Montgomery County 24/7 at (931) 645-1285. We proudly provide 24-hour emergency service. Storm damage in Clarksville toppled trees and damaged roofs. SERVPRO was called out during the storm to provide emergency tarps on roofs to prevent catastrophic water damage. Our nationwide network is only a call away when needed. 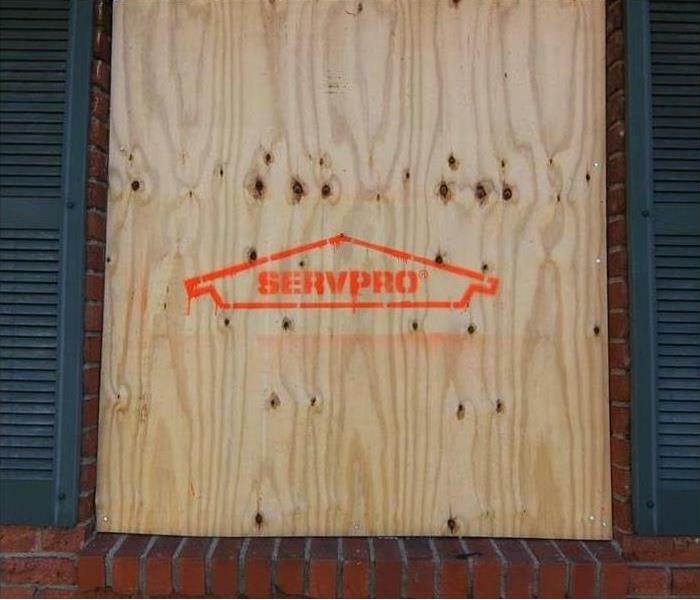 If your neighborhood is hit with massive storm damage, call SERVPRO of Montgomery County 24/7 at (931) 645-1285. We have the resources to tackle any size disaster. Fire damage at this Southside home utterly destroyed the kitchen. The remainder of the house fared somewhat better, but still smoke damage and soot were prevalent throughout the residence. The family was moved to a residence motel. The fire was a very traumatic event for them. We develop and present a project plan to the residents and their insurance company hoping that it provides a positive feeling about the positive outcome we know we will deliver. Using the latest in cleaning solutions and equipment we conquered the smoke damage and odor as the kitchen was being torn out and rebuilt. Seeing the happy faces of families returning to their home never seems to get old. If your home is harmed by fire damage, call SERVPRO of Montgomery County 24/7 at (931) 645-1285. We are here to help. Flood damage to this Palmyra condominium soaked the carpeting. You can see the water damage bubbling up as our crewmember steps on the carpet. If you can get the water damage cleaned up quickly enough, you can avoid the need to replace the carpeting. We were able to do that in this home. Sophisticated sensors assured us that the subfloor was still in satisfactory condition. If your home is flooded, call the experts at SERVPRO of Montgomery County 24/7 at (931) 645-1285. 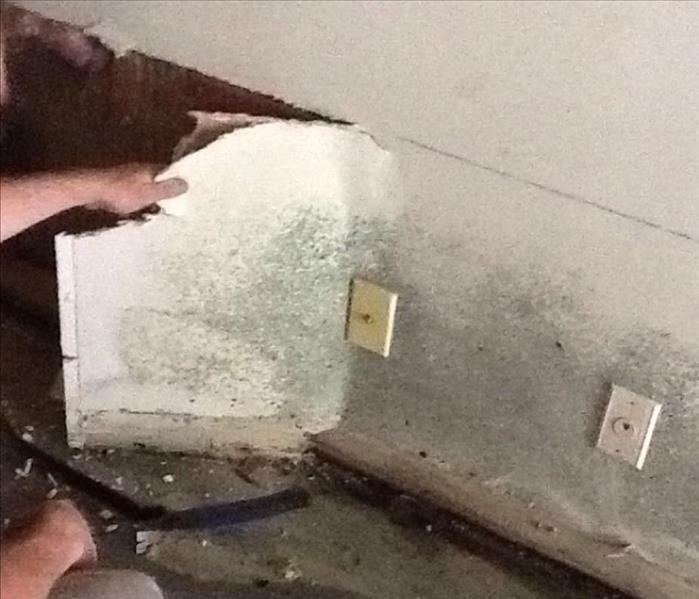 Mold damage in this Cunningham home began growing within 48-72 hours after moisture was introduced. It's crucial to start the drying process immediately after water damage begins. Some types of mold in large enough quantities may pose a health hazard. Timely attention to this situation by qualified professionals is imperative. 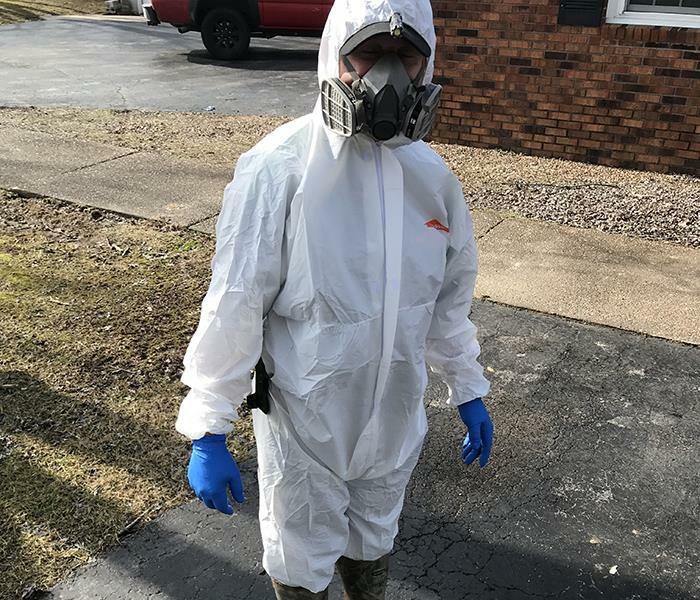 It is essential for the health of you and your family, as well as the protection of your property, to address the issue and arrange to have professionals begin mold removal as quickly as possible. Your prompt response will save you time and money! If your residence experiences water damage or you notice any sign of mold, call SERVPRO of Montgomery County 24/7 at (931) 645-1285. Ronnie is in Fort Campbell Carpet, definitely a expert at what he does. Makes one of the hardest machines to run, looking like a piece of cake! Keep up the good work Ronnie! Even the highest-quality items can show soiling over time. Protect your investment by calling your local SERVPRO of Montgomery County Professional to clean and maintain your carpet and upholstery. Todays carpet and upholstery materials vary dramatically. The SERVPRO System offers a number of cleaning options to match any type of upholstery or carpet. Water Damage occurred due to a gap left open between the wall and roof. Here we are injecting hot/dry air into the space above the drywall. When your Cunningham home is being threatened by water damage from flooding or leaks, SERVPRO of Montgomery County Professionals have the expertise to prevent or mitigate the devastating effects water damage can have in order to help preserve and restore your property. 24/7 Emergency Water Cleanup * 24/7 Household Mold Removal * 24/7 Residential Cleaning Services * 24/7 Mold Remediation *24/7 Bio-hazard Crime/Suicide Clean *24/7 Fire Restoration. This private school had increased humidity due to a faulty HVAC system. Because of the high humidity it resulted in substantial mold growth throughout the entire school. Each piece of furniture from staplers to desks had to be physically wiped down with anti-microbial. Along with the contents, the structure and duct system had to be cleaned as well.